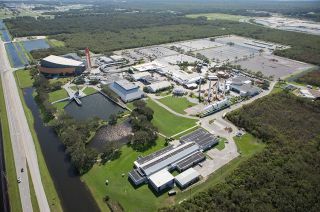 Aerial photo of the Kennedy Space Center Visitor Complex. The center reopened to the public after Hurricane Matthew on Sunday (Oct. 9). Hurricane Matthew blew the top off of a historic rocket, tore part of the roof off a house used by astronauts and toppled a space shuttle-era gantry arm on exhibit at NASA's Kennedy Space Center in Florida. The space agency on Saturday (Oct. 8) shared photos from an aerial survey of the center, showing areas that sustained damage from the powerful storm. Hurricane Matthew delivered sustained winds of 90 mph (145 km/h) and gusts that exceeded 105 mph (170 km/h) as it advanced northwards along the Space Coast overnight Thursday into Friday, about 26 miles (42 km) off the coast of Cape Canaveral. Photos and video from the aerial survey show that the center's iconic, 52-story-tall Vehicle Assembly Building (VAB) escaped damage. The VAB previously lost 820 panels from its south wall during Hurricane Frances, and 25 more off its east wall by Hurricane Jeanne, in September 2004. Photos on Saturday showed the walls, including the tremendous U.S. flag and NASA logo on the south side, intact. Another photograph taken adjacent to the VAB revealed that a large space shuttle artifact had been toppled. The orbiter access arm used by astronauts to board the shuttle atop Launch Pad 39A was blown over onto its side where it sat on outdoor display in the Vehicle Assembly Building's parking lot. Nearby exhibits of an armored M-113 astronaut escape vehicle and an Orion abort system tower mockup looked to be unscathed. NASA did not show the condition of Pad 39A, which is being modified by SpaceX for commercial launches. A statement provided by SpaceX to the technology news website Ars Technica said that the company's facilities at the historic Apollo and shuttle pad were not damaged. SpaceX confirmed that a Cape Canaveral payload processing facility that it uses sustained "some damage to the exterior." Satellite imagery acquired and released by the National Oceanic and Atmospheric Administration (NOAA) showed Pad 39A's major structures intact. NASA photos of Pad 39B, which has been prepared for the agency's new Space Launch System (SLS), did not show damage. Roof damage from Hurricane Matthew to The Beach House at NASA’s Kennedy Space Center in Florida, a 1962 two-story house that was used by astronauts prior to their launches. The same could not be said for several support buildings around the center, which suffered roof damage. Similarly, part of the roof was torn off The Beach House, a 1962 two-story house that was famously used as a pre-launch astronaut hangout. A photograph taken over the Kennedy Space Center Visitor Complex showed only one noticeable sign of the storm's effects. The top of the Thor-Delta, one of seven historic boosters standing in the park's popular Rocket Garden, is missing. The Visitor Complex said that its display of the retired space shuttle Atlantis was unaffected, as were its other indoor exhibits. The Visitor Complex re-opened to the public on Sunday (Oct. 9), though without its bus tours of the Kennedy Space Center and access to the Apollo/Saturn V Center located on NASA's property. Direct bus service to the moon booster's building was set to resume on Monday. The status of NASA's historic Mercury and Gemini launch pads and facilities at the Cape Canaveral Air Force Station was unknown, though NOAA's satellite imagery showed a replica Mercury-Redstone rocket was still standing at Launch Complex 5 (LC-5). The 45th Space Wing at Patrick Air Force Base, which controls the Cape Canaveral Air Force Station, reported damage to some of its older buildings. A Navaho missile display located at the station's entrance gate was also toppled. See more of NASA’s photos of the damage from Hurricane Matthew at collectSPACE.com. Follow collectSPACE.com on Facebook and on Twitter at @collectSPACE. Copyright 2016 collectSPACE.com. All rights reserved.